An award-winning Indian novelist, and daughter of renowned Kannada writer and dramatist Sriranga, Shashi Deshpande published her first collection of short stories in 1978 and won the Sahitya Akademi Award for her novel That Long Silence in 1990. The rest of the keynote address covered her feelings, experiences and views on the current scenario regarding the writers’ protest. She said she felt confused by it all. She pointed out that one of the problems of this debate of writers protesting has been too many misunderstandings and the subsequent discussions. Unfortunately, the emphasis has been more on the returning of awards that on the larger issue – why awards were not returned earlier, and why they are being returned now. What began as a writers’ movement has now turned into a confrontation between two opposing sets of writers. It’s not only disturbing but distressing. 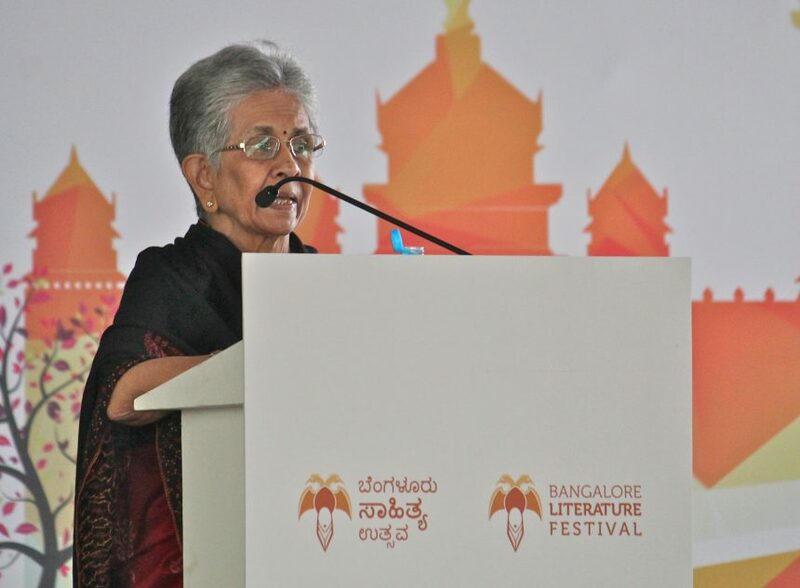 Deshpande’s distress and concern over the growing divide was evident when she described it as a clever manipulation by a third party, perhaps. “That a scholar who had only written his honest opinions could have been shot at his place in Dharwad was shocking,” she said, as she descried her grief over the murder of renowned literary figure M M Kalburgi. She went on to discuss her reasons for stepping down from the Sahitya Akademi’s general council, when she found out that the Academy had callously dismissed the death as natural, and had held a small condolence meeting with just two people. The rest of the keynote address covered what writers today have been subjected to in their peaceful protest for justice. “Writers have been compared to sheep lately. I think of it as one spark lighting another”, she said. Can a writer be an activist? There are always divided opinions on this subject. There are too many and much louder voices speaking today. Writers’ voices are drowned out, if they speak at all. It’s as if they know their opinions no longer matter. For the first time, there has been a community of writers’ voices speaking, coming together to voice their fears. Instead of taking notice, the government has been playing down the cause. In this rising intolerance in the nation, how can the free thinker and the artist truly survive? The very act of writing compels thinking. However, writers are spoken of in a very derogatory manner today. Sashi disagrees with the popular opinion that writers were insulting the award by returning them. It’s not disrespect, but is in fact a sacrifice. The awards are a writer’s most precious possession, and to give them up is to give up what they love the most. Their sacrifices were aimed at drawing attention to something important happening in the country. Most authors who started the movement are senior authors who do not need publicity. They are respected in their languages and in their fields. The same was said for the political consideration of the movement. “If the movement was to steer Bihar elections, I would stand up and cheer, because that would mean writers have a lot of power. Why would a political party patronise writers? They have nothing to offer politicians,” she said. Shashi also went on to describe today’s scenario as that which bore a dreadful resemblance to the McCarthy era in the United States, when the US government played on the public’s fear of communists. Nobody was exempt from investigation and questioning. Writers and artists especially were blacklisted. There was a deep divide between writers who defended and writers who told on friends. “This polarisation is visible today, in India. Writers must learn to ignore deliberate mischief created via social media. Writers need to understand, especially now, that literature is inclusive”, she said. No writer can write according to ideology. Their freedom is important to society. Through their stories, the future will know about the times gone by. The calms, the storms, the happinesses and the fears. There is no place for a majority view or unanimity in this field. Creativity means uniqueness. Resistance lies at the heart and soul of literature. We need many views and opinions, we need to agree to disagree. Writers need to talk to each other and not at each other.